Due to this huge demand of iOS apps in daily life, Click Labs has also developed an awesome Tachometer App for iOS which measures the frequency of rotation (RPM) with the iPhone camera or we can pronounce it as an RPM calculator App for iPhone. All of us know that iPhone is not just a simple phone due to its several advantages in everyday life. I think there is an App for everything from a wake up alarm app to an application that gives weather or Traffic update. In fact doctors use an iPhone to measure the heartbeat of patients. Due to this huge demand of ios apps in daily life, Click Labs has also developed an awesome Tachometer App for iOS which measures the frequency of rotation (RPM) with the iPhone camera or we can pronounce it as an RPM calculator App for iPhone. 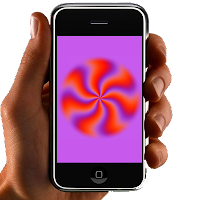 This App takes snapshots of a rotating device or a rotating fan (as you can see in the video below) after regular intervals using the iPhone camera. Actually it finds a center of rotation from a point which we mark at one edge of rotating device. By using the center of rotation from that point it calculates the angle of rotation per minute and tells RPM of a rotating device. The current version works consistently with a speed of 200 RPM but Click Labs is working on it to make it much faster. So stay connected with Click Labs for latest updates about tachometer App.